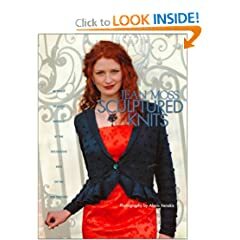 I love Jean Moss’s patterns in Sculptured Knits since they have unusual pattens that are knit into the fabric. The Klimt Vest pattern contains a variety of triangles that are interwoven like one of those intelligence tests. I modified the neck line from a V-neck to a shawl collar which my husband prefers and I added sleeves using the pattern stitch just above the cuff. The color is a rich navy blue that looks wonderful in the sunlight even next to black (my husband’s favorite color). It’s knit in Austermann’s Korfu which is a cotton and wool blend that’s light enough to wear in the spring and fall. Congratulations! I knew you would meet your deadline!